Suffering from stress-related tension, fatigue, carpal tunnel syndrome, migraine headaches or low back pain? Have your attempts to resolve the problem through traditional medical treatments been unsuccessful? Scheduling an appointment with Allied Chiropractic could bring you the much needed relief you are seeking. Often confused with physical and massage therapists, chiropractors are able to provide a much more comprehensive service than either; and are in effect, primary care physicians. "We perform exams, take x-rays, provide a diagnosis, design a treatment program and administer all treatments," says Dr. Wilkinson. Chiropractic is the world's largest single body of natural health practioners, with more than 50,000 DC's licensed in the U.S. The training of a chiropractor is similar to that of a medical doctor, involving a combination of more than 4,000 lecture hours and clinical training. In fact, chiropractors receive more training in both neuromusculoskeletal and radiology studies than do most general practioners. Dr. Wilkinson has also received extensive additional training in orthopedics, nutrition, differential diagnosis and acupuncture. "Most people can benefit from ongoing, chiropractic preventative care," says Dr. Wilkinson. 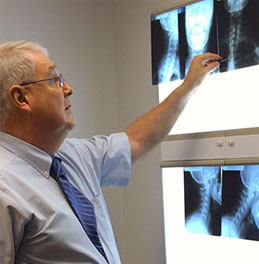 He states that patient education is an important part of a chiropractor's job, because many people do not know the many benefits from this type of health care. A schedule of regular chiropractic checkups designed for your age, condition and lifestyle can help detect, correct and maintain optimum spinal and nervous system function. Expectant mothers can also benefit from chiropractic care, especially in their third trimester, as chiropractic care can help alleviate some of the discomfort and stress to the lower back that extra weight gain causes, with no adverse effects on the baby. Some problems that respond well to chiropractic care are migraine and muscle tension headaches, upper back and neck pain, sprain-strains of the back and neck, carpal tunnel syndrome, tennis elbow, tendonitis, whiplash, lower back pain and numbness and tingling in the arms and legs. Dr. Wilkinson also sees patients who have experienced personal injuries (automobile accidents, slip and fall and work related accidents). Symptoms that signal a need for treatment include experiencing headaches more than once a month and having twinges and muscle spasms in the legs and buttocks. One reason people avoid chiropractic care is fear of the unknown. "Ninety to one hundred percent of the time there is no discomfort during treatment," says Dr. Wilkinson. "The odds of a patient having an adverse reaction are minimal. Chiropractic procedures are very safe and patients coming to Allied Chiropractic will find a warm and caring environment."